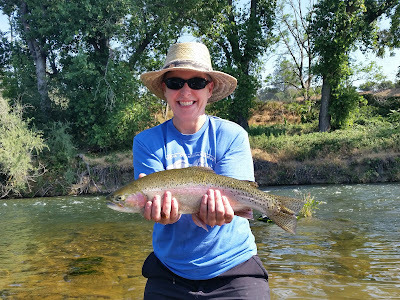 A detailed report on some of Northern California's finest rivers and streams which include: Yuba, Feather, American, Trinity, Lower Sac, Upper Sac, Truckee, Putah, Alpine County and many more. Wow, where has this year gone, April was EPIC, May was here and gone with some more great fishing, now we are in June and the fishing is really good too. I know I say this a lot, but you should really be out on the water and enjoying some great fishing. Man when things started to look dim, the Feather comes back and shines like it always does, and it continues to give us some really nice days on the water. If you want to get into some late spring and early summer run steelhead, well look no further than the Feather. We are seeing good numbers of half pounders up to 18" as well as a good handful of adults up to 26". Hooking 10 to 12 fish a day is the daily scene, and not hard to do, and if you are not careful you can hook many many more. Just recently we had a day where we hooked 20+ fish, can you say sign me up. 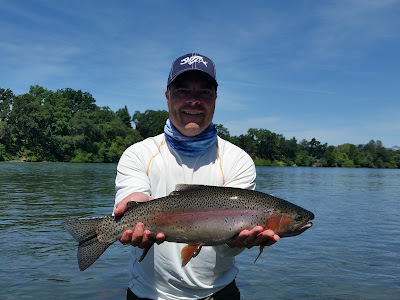 Dont know how much longer this will last, but with the low flow at 1700cfs and running cold, salmon showing up daily, and every steelhead we hook chrome bright, it should be good to great for the month of June and well into July. As always, hottest steelhead pound per pound around, and these fish will hurt you on a 6wt. Another hot spot right now, and if you can stand the heat, you will hook as many fish as you can handle. Most days hooking 20-25 fish is not uncommon, and hooking 30+ is not a far feat to accomplish. As far as the heat goes, a nice dip in the Lower Sac will take care of that, and keep you cool for quite some time, typically done soon after lunch, gotta wait 30 mins you know. The Lower Sac will continue to produce some awesome fishing and great catches, fish from 16-22", with some bigger fish in the mix as well. If you want to hook quantity and quality, this is the place for you. As far as how long this will last, only the fish truly know, but it will definitely be great for the month of June and July. The shad are in and so are the stripers, and we are hooking some great numbers of both as I type. Evening is best for the shad and in the upper stretch of the river, only problem is most anglers/guides are up there too. Most of my trips are going after stripers, getting on early and getting off by 3pm for full days, and by noon for half days. But what is really awesome, is the the striper fishing is so good, that if you dont want to get on the water super early you dont have to, but most anglers like to beat the heat. We are not seeing the huge stripers right now as they are eating the shad, but fish 5lbs and under are being hooked in great numbers. 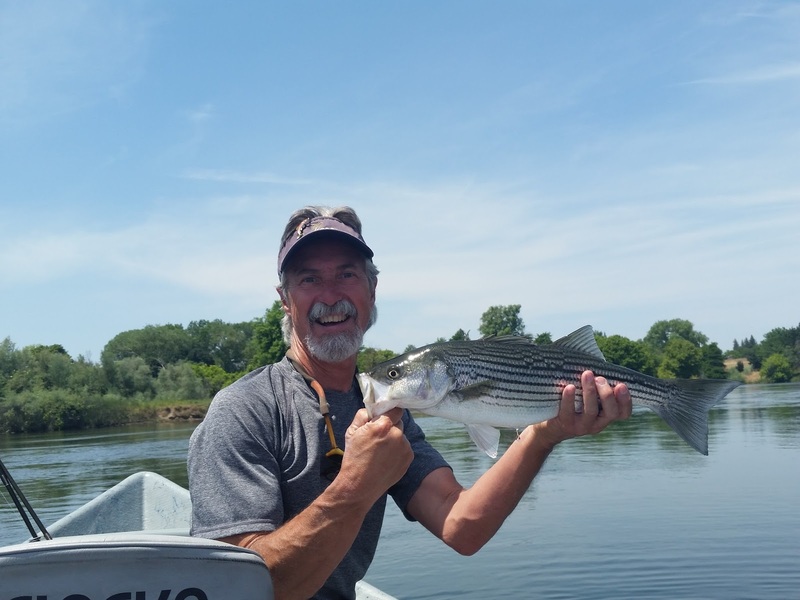 A day last week, I had a single angler that boated 50+ stripers in a full day guided trip, can you say epic. We are using 8wt rods with 350gr striper lines, just in case we hook the big one, but you could get away with a strong 6wt or slower 7wt. But I personally think the heavier line helps get that fly down, giving it a better presentation and will produce a lot more fish. Even though a lot of the fish we are landing are 16-20" fish, they still put up a great fight on the 8wt, and you will be glad you had it when you hook the big girl. As far as shad, the majority of them as well as the anglers are up top, especially in the evening, with many smaller pods of fish and anglers spread throughout the lower river. With the numbers we are seeing of stripers, I havent had the time to chase to many shad, but if you are looking to get out, now is the time. This is a tough fishery right now for trout. You get a fish here and a fish there, give it some time she will be ready to go, but right now, there are better trout fisheries to be fishing. Flows are steadly coming down. Shad, shad and more shad. Great for a half day walk and way, but can be done as a full day walk and wade as well. You want to shad fish with very few people, this is the place to be. I am able to access the water at the rod and gun club, so if you are looking to get out, lets go hook some shad. Flows are still on the high side, and water still cold, but we are seeing to really good quality fish. The numbers are not there yet like the Truckee is know for, but what it lacks in quantity, you really do make up for quality. A few more weeks of this warm weather, and the snow run off should be done, and the fishing should turn on like a light switch, I would say by July 1, it will be in perfect shape. If you are looking to get out, whether booking a trip or just fishing, look to late June early July and on through the summer months. There is a ton of water up there, and this will be one great trout fishery throughout the summer. There you have it folks, and as you can see, the fishing is really good right now. Its time to get out and enjoy what the talk is all about. For dates after September, please feel free to ask. may be available. Please inquire if none of the dates above work for you. There you have it folks, I hope you enjoyed the recent fishing report, and I hope you are all having a great fishy year. It really is the time to get out and enjoy what Nor Cal has to offer, it is one of the best fishing seasons we have seen in almost 10 years. And once again, thank you for all your support. PS: On a side note, I have been given the opportunity to guide in Alaska for a few weeks in August, from the 10th to the 21st. As of right now, those dates have been guaranteed. However, more could become available if they have a few more clients book. If you are looking to book any dates while I am up there, I will have access to a computer on a daily basis to help you with any future bookings or questions you may have. But, further more, my wife Deanna as well as my guiding partner Tom will also be able to assist you. If you happen to book any dates soon after my return, and I am still in Alaska, either Tom will take you out, or we can reschedule to a future date, which ever is best for you at the time. PSS: Lastly, Ill be hosting a trip to Baja next year, July 24th to 28th, 2017. It will be through Baja Pirates out of La Paz. Ill be sending over the details in a few days. However, you are more than welcome to check out their site for info about them and what they offer. I will be hosting/offering my clients with a 5 day, 4 night, 3 days of fishing for $1100 (based on double occupancy), normally $1500. Again, additional info on the way. This is a great opportunity to fish Baja during peak season for Yellowfin Tuna, Dorado, Sailfish, Wahoo, and the possibility of hooking, Marlin, Rooster fish and many more. If you are interested, please feel free to email or even call me for questions. Once again, thank you very much for making my passion a true success.